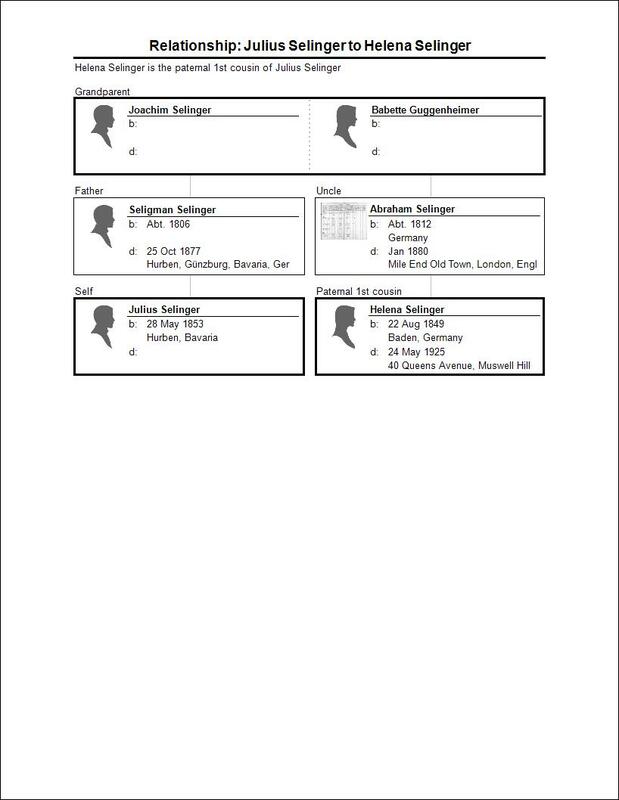 Yesterday I received an email from Ann Griffin Selinger, whose husband was John Reynolds Selinger, Sr. John Selinger was the son of Maurice Selinger, Sr., and the grandson of Julius Selinger and Augusta Cohen, the oldest child of Moses, Jr, and Henrietta Cohen. I was so touched by the stories that Ann had to share about her husband John and his family that I asked her whether I could quote from her email on the blog and share these memories of her family. She graciously gave me permission to do so, and so here they are with just a few side comments by me. Ann’s language is italicized, whereas mine is in regular font. My husband, was John Reynolds Selinger, 1933-2007, born in Washington, DC as was his brother, Maurice Arthur Selinger, Jr. For a time we lived in Chevy Chase, Maryland and one day we received a visit from Eliot Selinger who apparently lived around the corner from us with his family. We had exchanged mail a few times without meeting, but never looked into whether we were related. He told us at the time that he thought we were related and that his father and John’s grandfather were brothers – Frederick and Julius. We had been under the obviously false impression that Julius had no siblings. 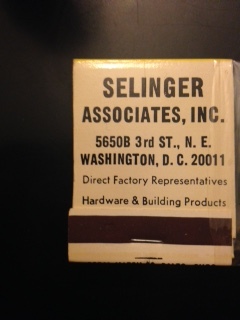 Interestingly, Mildred Selinger, Dr. Maurice A. Selinger’s wife, having lived in Washington her whole adult life, lived with us just before she died in 1981. I see that Eliot died a year later. He must have knocked on our door just before he died. The comment about Julius and Frederick Selinger being brothers was a very important revelation for me because it confirmed what I had suspected. 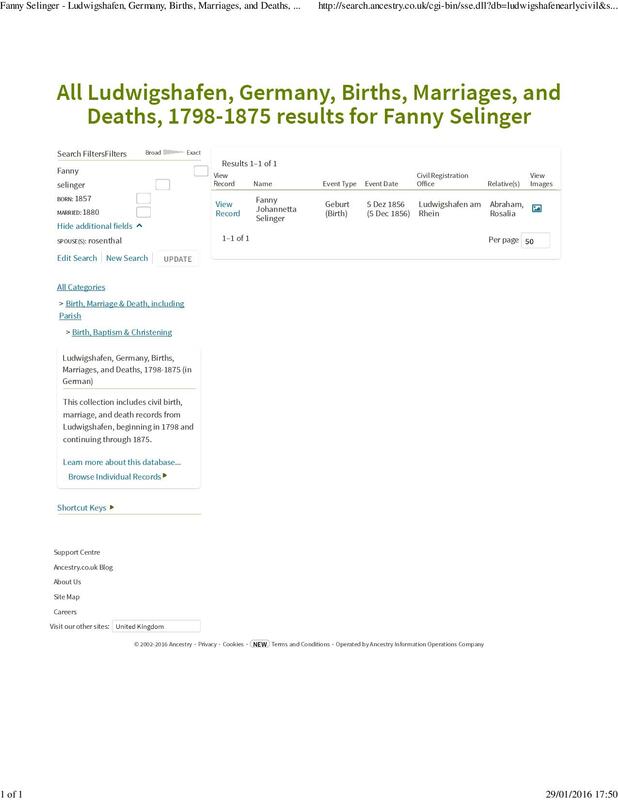 I assume that Alfred Selinger was also, given that he lived with Julius and traveled with Julius and Augusta before marrying Augusta’s sister Fanny. 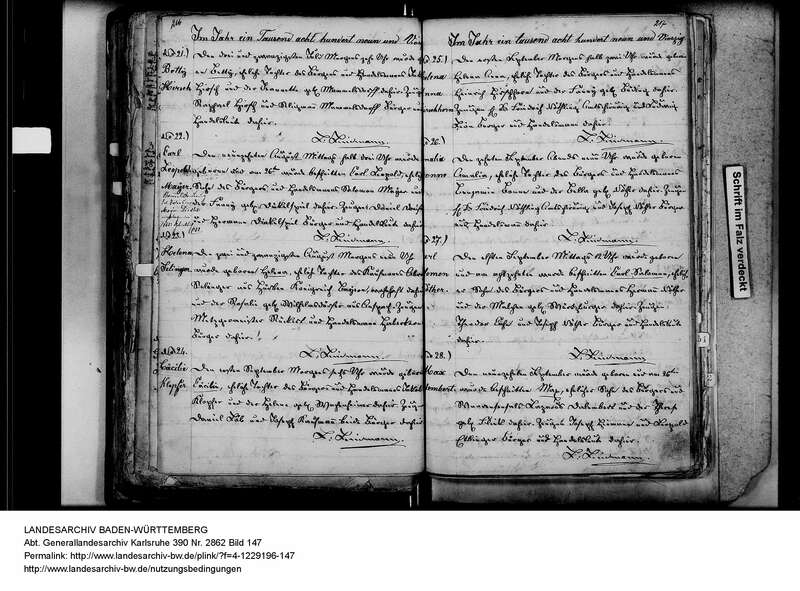 Here is a bittersweet story about Eleanor Selinger, the daughter of Julius and Augusta who married Henry Abbot and moved to England as discussed here. 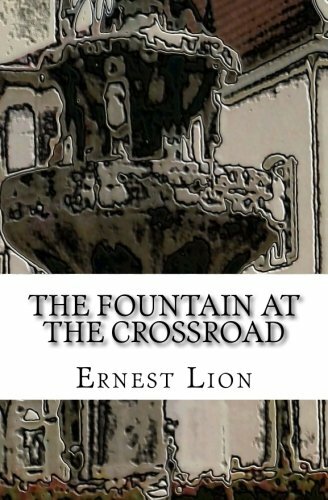 Years earlier, John and I were in England and he said he would like to see if he could find his Aunt Eleanor. We were successful and made arrangements to have tea with her in her apartment just before we left London. When she opened the door, John was astonished to notice she looked exactly like his Dad who had died over ten years before. We had a lovely visit. She shared that she loved to play cards, but had a hard time see the cards now. So the next day we had some “jumbo faced” cards sent over to her from Harrod’s – a fun idea. She called us to say she was so flustered when the delivery man said he was from Harrod’s that she had a hard time buzzing him in. Very sweet – a wonderful connection that pleased my husband very much. We flew home the next day and then received word a day later that she had died. 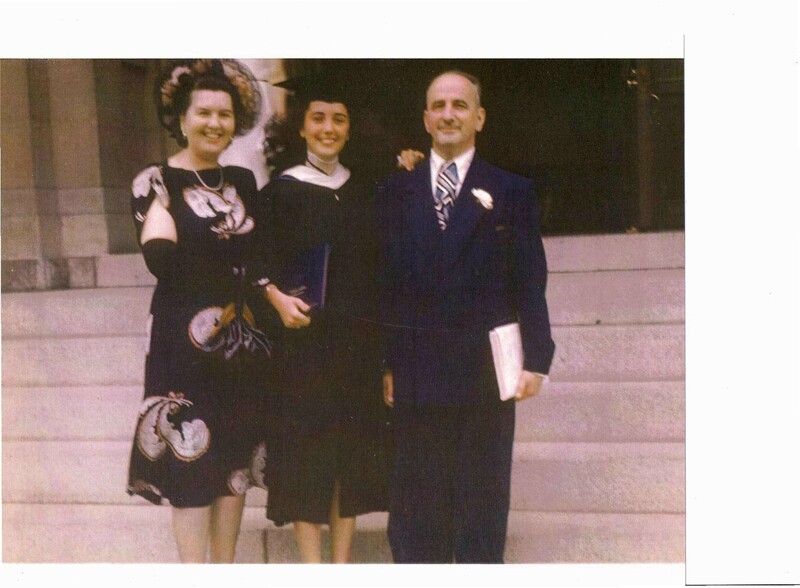 Ann also told me more about the accomplishments of Dr. Maurice Selinger, her husband’s father, who along with his brother Jerome were probably the first doctors in the extended Cohen family, as discussed here. Dr. Maurice Selinger, my father-in-law, who died before John and I were married, served in World War I and World War II as a physician. He was a very dedicated doctor who gave his all to medicine and his patients. 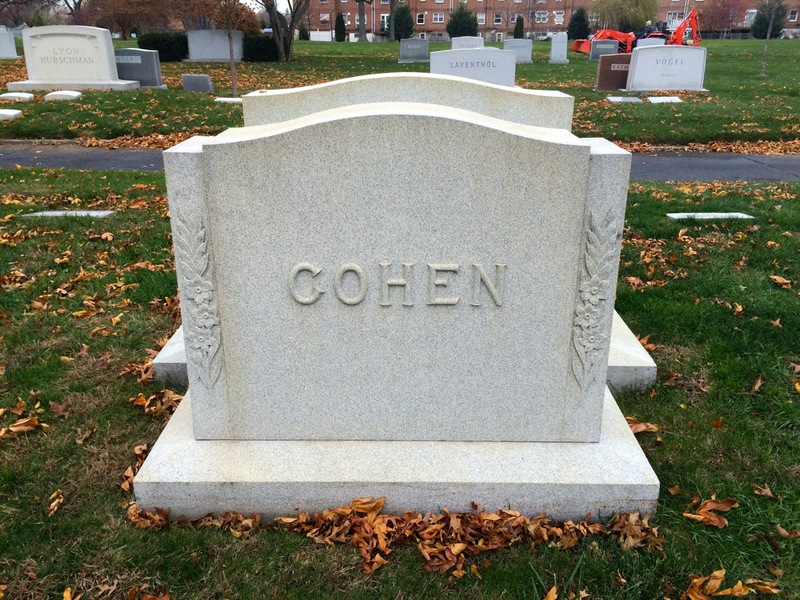 He was very highly regarded in the Washington medical world. 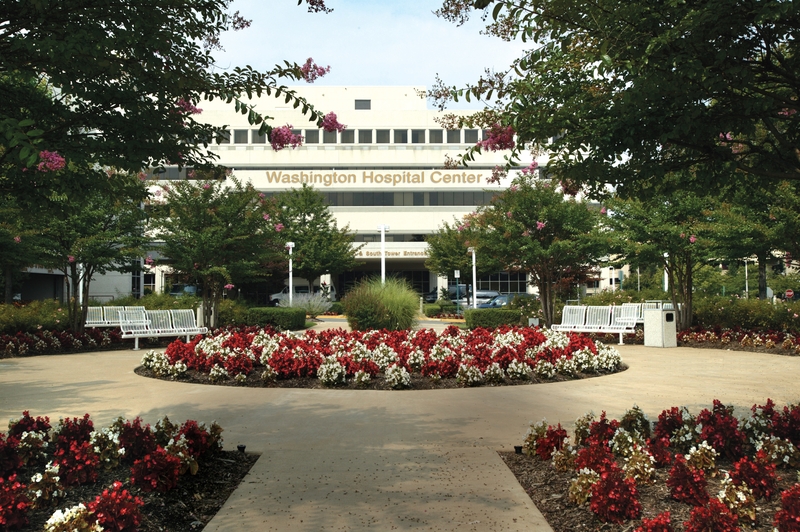 He was instrumental in bringing three hospitals together (Garfield, Emergency, and one other – can’t remember) to form the new Washington Hospital Center. I remember just after we were married going to a diabetes center in Maryland that was dedicated to Dr. Selinger. I know nothing more about that. Amazing what you don’t pay attention to when you are young. They lived in a lovely home on California Street, NW – should look up the number, that is now the Embassy of Venezuela. 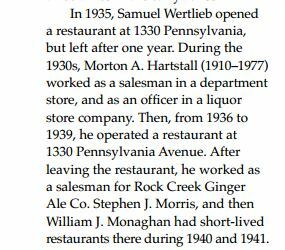 And finally this story about John’s father Maurice and his grandfather Julius and the Selinger’s jewelry store on F Street discussed here. John always told the story that when his father was a young boy he would earn his allowance by winding the clocks on F Street that were installed by his grandfather, Julius. They also put the clock in the tower of the old National Savings and Trust Building downtown. 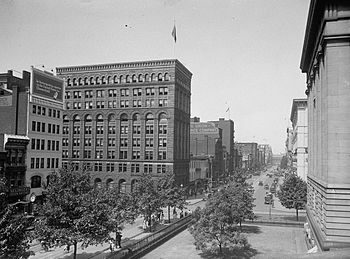 Years later, John became a banker and worked as a Vice President in that same bank. There is nothing better than hearing and preserving these family stories. They take the facts and inferences I make from government documents come to life and fill them with the love and respect that these people deserve. Thank you so much, Ann, for sharing these with me. I can’t tell you how much it meant to me. The Library of Congress page also states that the photograph was a gift from Herbert A. French in 1947. 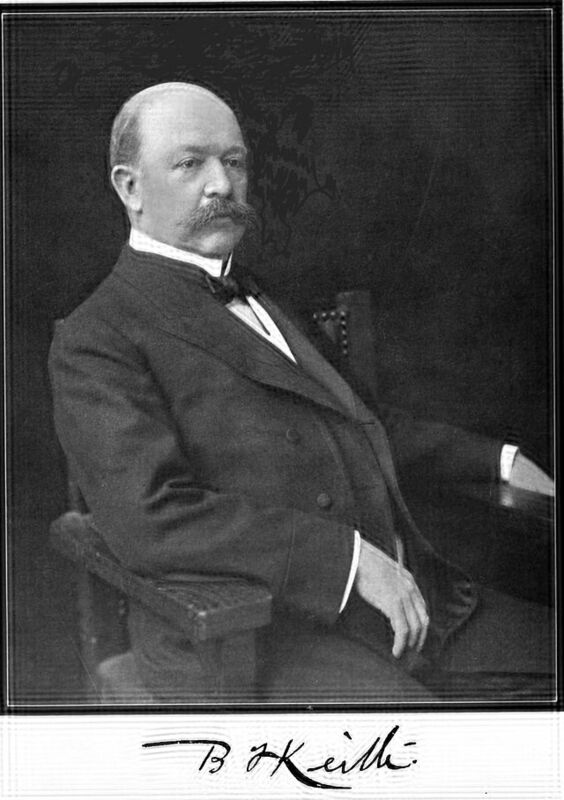 Herbert French was a photographer as well as the owner of the National Photo Company; he donated his entire collection to the Library of Congress, including the photograph of Selinger’s. 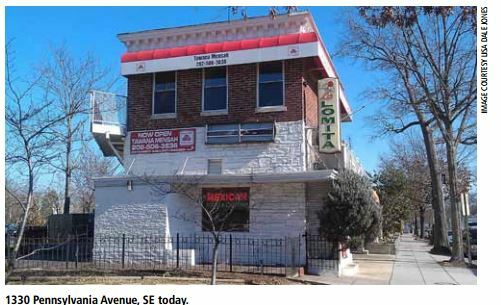 The ad says that the store was located at the corner of 9th and F Street, so it might have been in the Warder Building, which was built in 1892 near the Adams House. 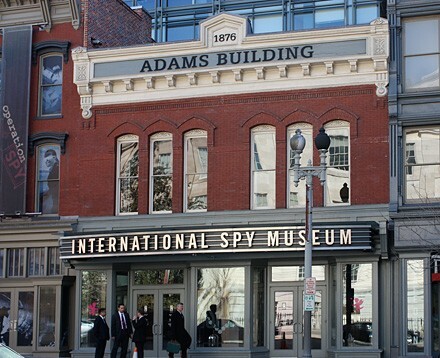 Both buildings are today used to house the International Spy Museum. The building across the street, seen in the reflection of the Selinger’s window, is the Donald W. Reynolds Center for American Art and Portraiture, part of the Smithsonian. 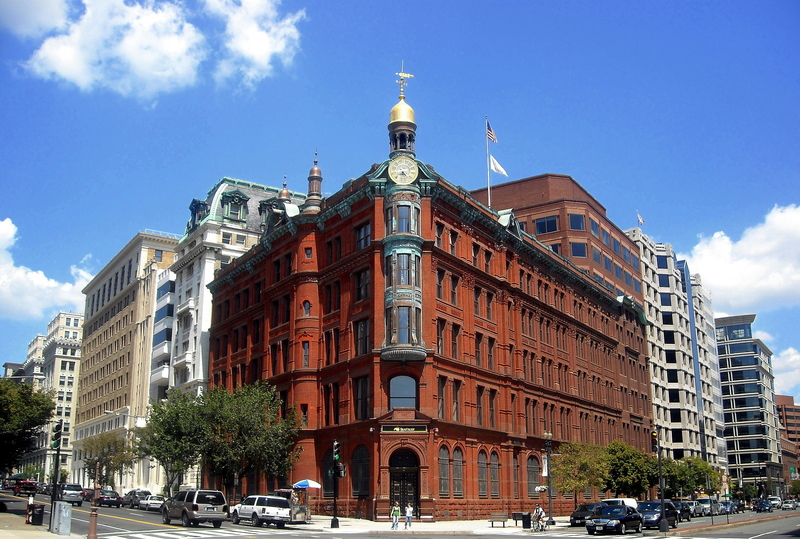 It was originally the building for the US Patent Office. Thank you to my brother Ira for finding most of these sources. For those who may wonder, a photograph taken in 1920 would no longer have a valid US copyright and is thus in the public domain. Shorpy’s may be selling copies of it, but that does not include or suggest a copyright still exists on the photo. I had two wonderful surprises this week. Usually I am hunting down family members, hoping for a response. Twice this week I heard from relatives who found me. The second wonderful surprise came in the form of a comment on the blog from a descendant of Julius and Augusta Selinger, their great-grandson Cito. He had just accidentally found the blog while searching for something else and was pleased to see and learn more about his family’s history. He then sent me this wonderful photograph of his great-grandfather Julius’ jewelry store. 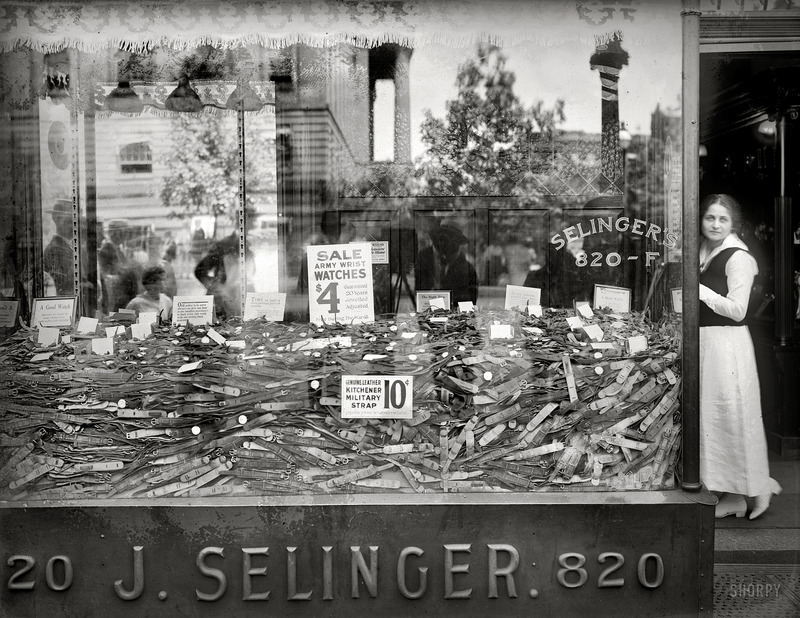 Although the photograph is not dated, if you look at it closely, you can read the larger sign in the window that says “Sale…Watches…$4,” and see at the bottom “Price during the War +15.” I am not exactly sure what that means, but I assume that the reference is to World War I, dating the photograph during the second decade of the 20th century. 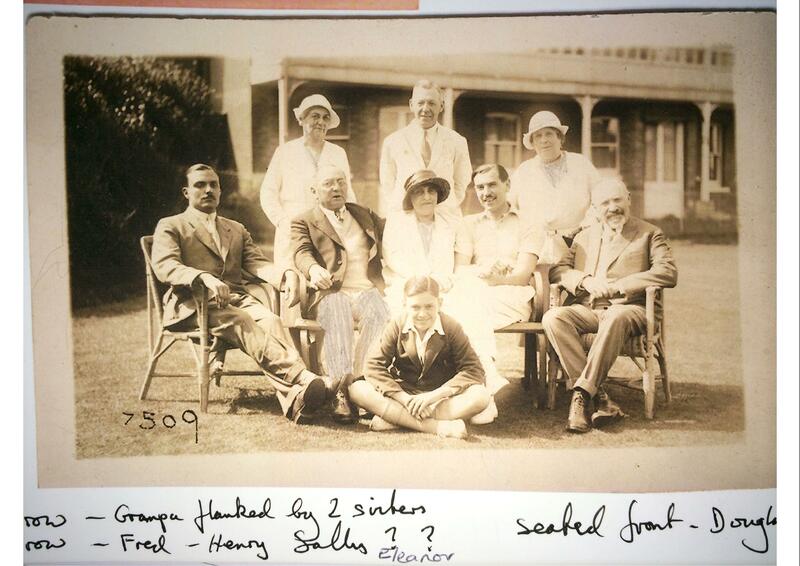 That makes sense because the young woman to the right standing in the doorway is assumed by the family to be Eleanor Selinger, the daughter of Julius and Augusta who married Henry Abbot and moved to London in 1926. Eleanor would have been about 22 years old in 1917 when the US entered World War I. I love being able to see Eleanor’s face also. She has such a searching, pensive look on her face—what was she thinking? You can see the reflections of a crowd of people looking into the window as well as some of the buildings across the way. 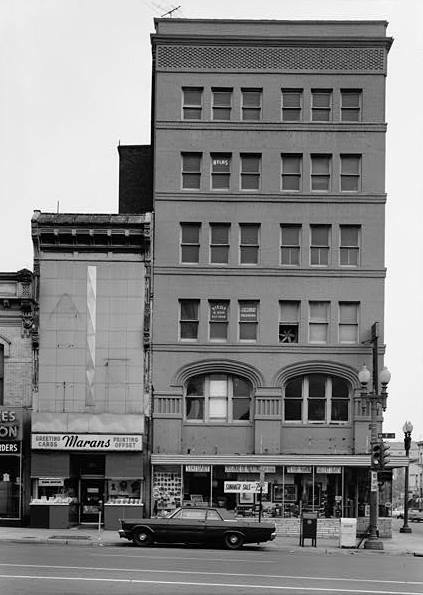 The store was at 820 F Street in Washington, DC. Perhaps some of you recognize that location? Thanks to both Lou and Cito for generously sharing these photographs and for contacting me. I am so happy that you both were able to find me. 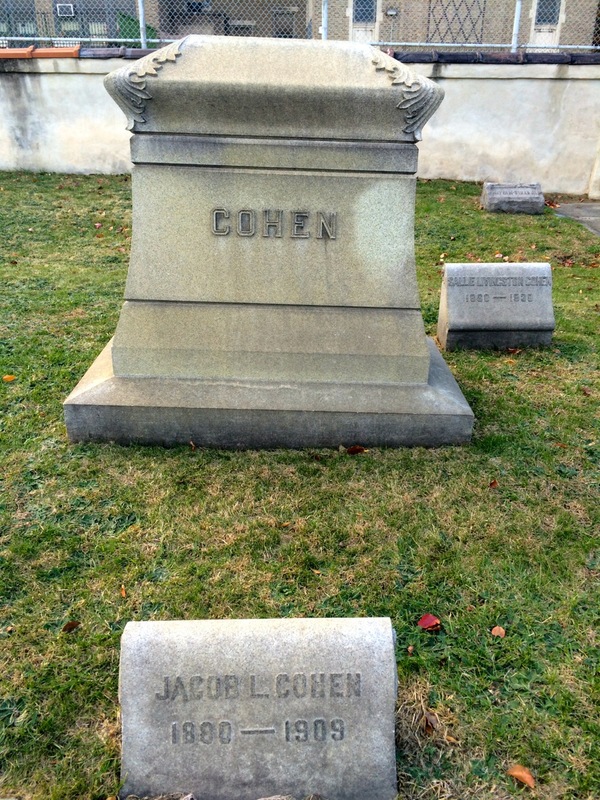 I also received photographs from another family member this week, my cousin Jack, the great-grandson of Joseph Cohen, who was my great-grandfather Emanuel’s older brother. I will post some of those photographs next week after I have a chance to scan them. 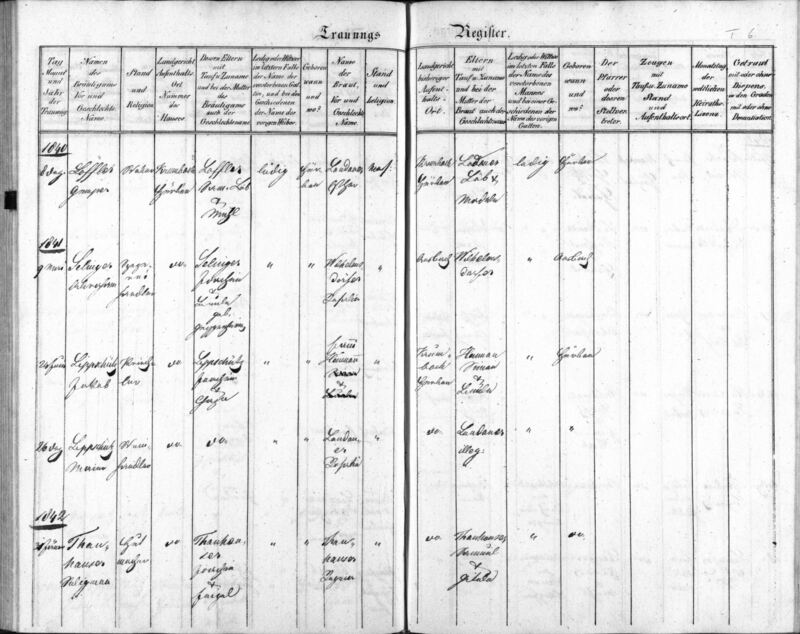 So it’s been a great week to be doing genealogy research. 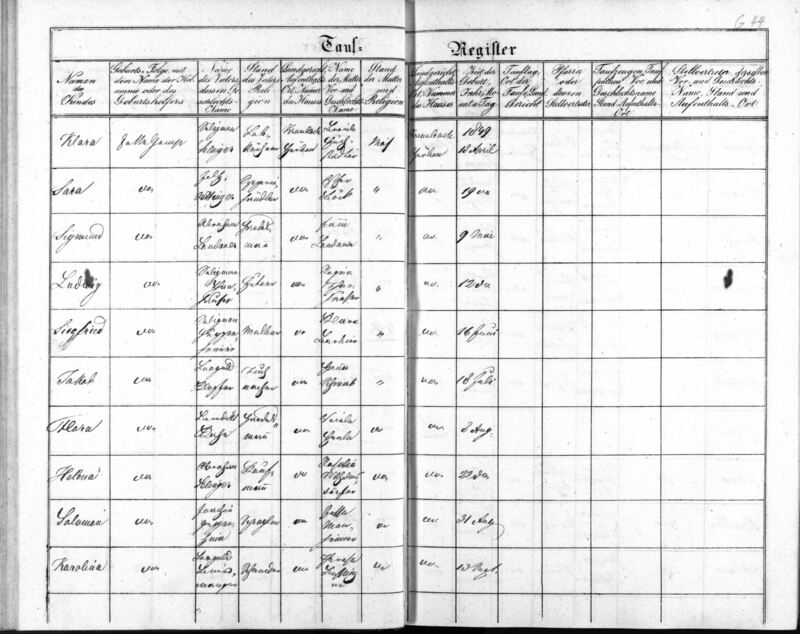 I am feeling very fortunate for all the gifts that genealogy has provided to me. Happy Labor Day Weekend, everyone! 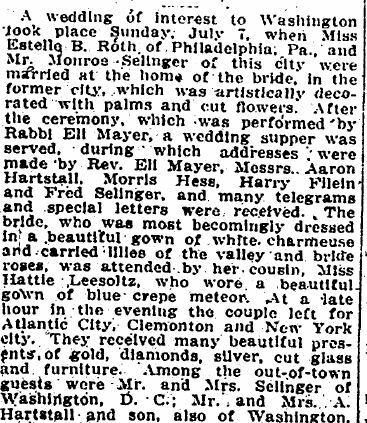 Moses, Jr., and Henrietta’s daughter Augusta celebrated her 25th wedding anniversary with her husband Julius Selinger in 1909, as described in my earlier post. Their children were all still living at home as of 1910, but the next two decades would see them all finding their own independent paths. 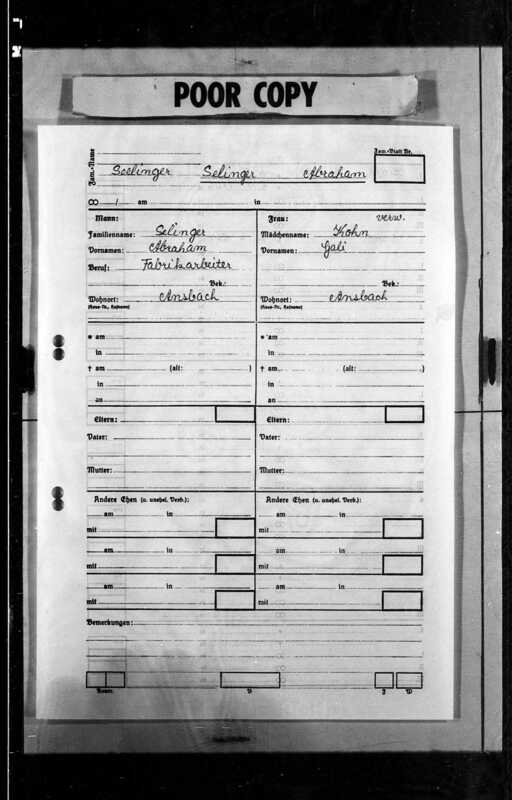 Julius continued to work as a jeweler in his store, Selinger’s, and in 1922, he and Augusta along with their daughter Eleanor traveled to Germany, the British Isles, and France, apparently for health reasons, according to Julius’ passport application. That application contains photographs of both Augusta and Julius, shown above. Sydney, their oldest son, had become an optician as early as 1906 when he was 21 years old. 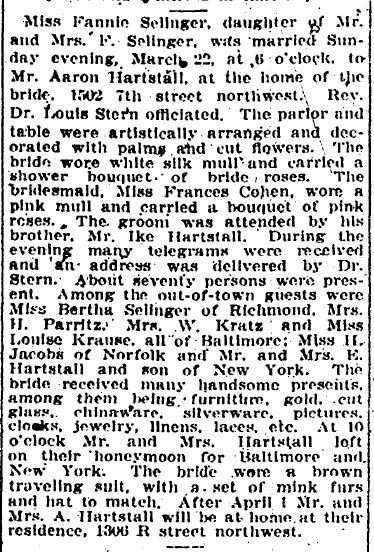 Although he was still living at home in 1910, on September 3, 1917 he married a woman named Grace Bloch. 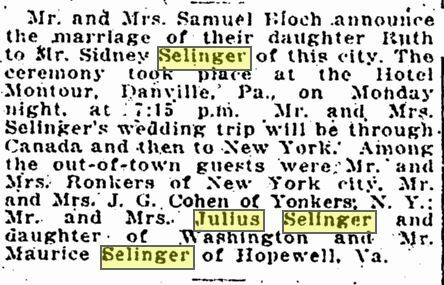 Although I have not yet found an official marriage record, I know from other records that Grace, Sydney’s wife, was born November 20, 1895 or 1896 in Danville, Pennsylvania, and I found this newspaper announcement of the marriage of Sidney Selinger of Washington, DC, and a Ruth Bloch, daughter of Samuel Bloch, in Danville, Pennsylvania. 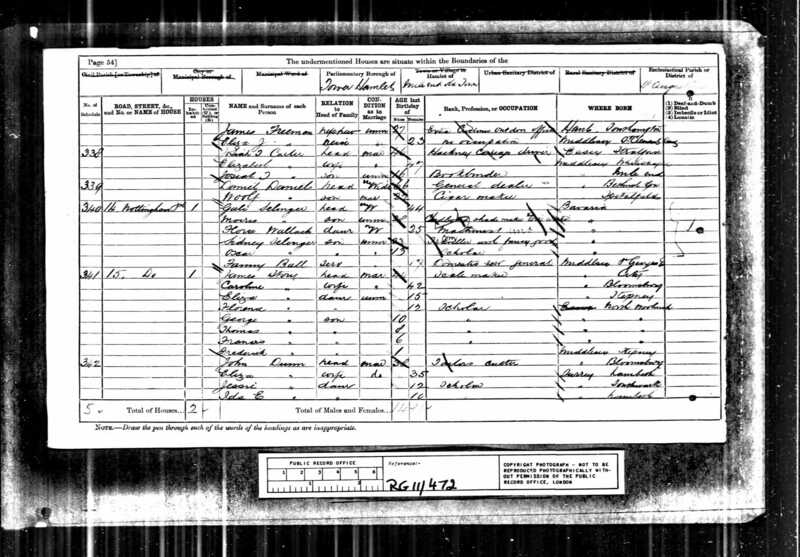 I am not sure why the paper gave her name as Ruth, as every census report shows that Samuel Bloch’s daughter was named Grace. But since they also spelled Sydney’s name incorrectly, I assume it was just an error. 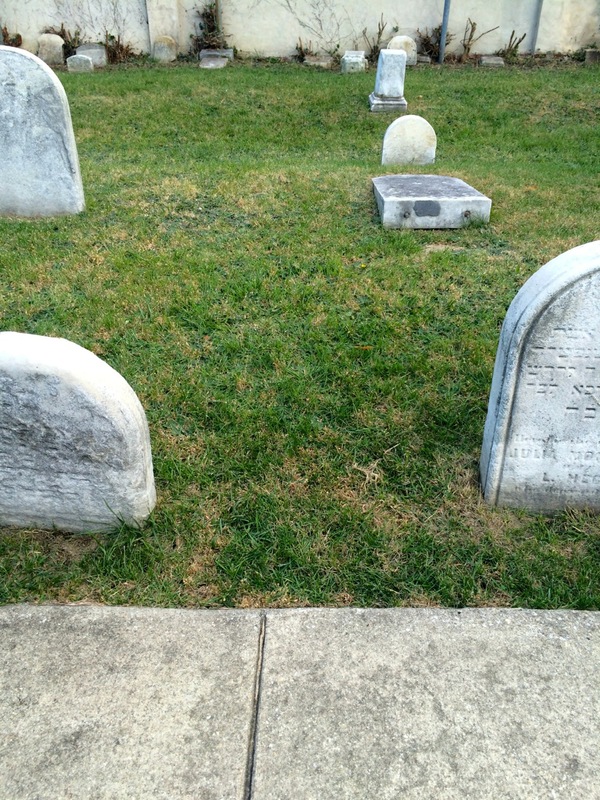 Sydney and Grace did not have children, and they lived in Washington, DC, at least until 1940. 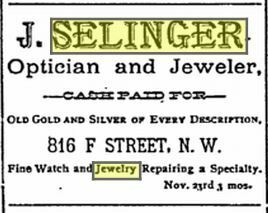 They both seemed to be working in the retail jewelry business in 1940, and even in 1930 Sydney listed his occupation as in the jewelry business, no longer as an optician, presumably in the family jewelry store, Selinger’s. By 1956 Sydney and Grace had moved to Hollywood, Florida, where they lived for the rest of their lives. Sydney died in May, 1967, and Grace three years later in May, 1970. 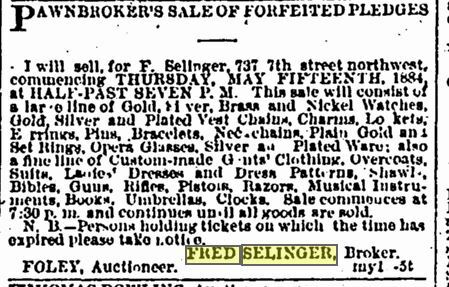 Harry, the second son of Augusta and Julius Selinger, was in the Selinger’s jewelry business from at least 1910 when he was 22 until at least 1935, the date of the last record I have for him. Harry claimed an exemption from the draft for unspecified physical reasons in 1917 and was still single at that time. 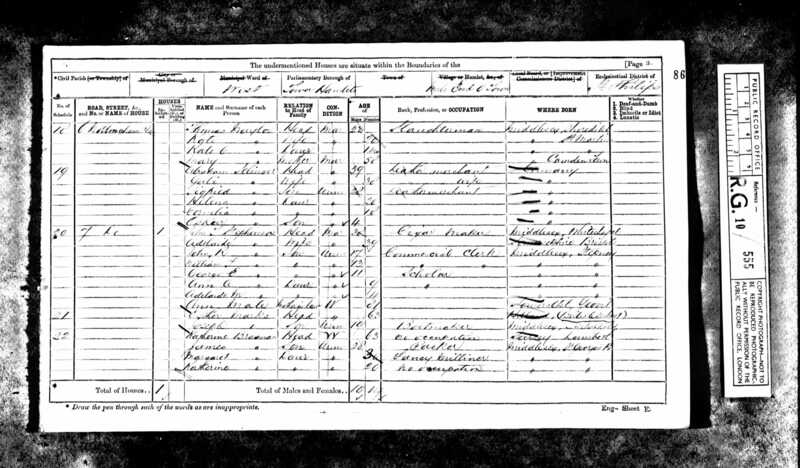 He married Mary Jessop on August 22, 1924, when he was 36; it appears that he and Mary did not have children either as there were none listed as living with them on the 1930 census when Mary was 43, six years older than Harry. 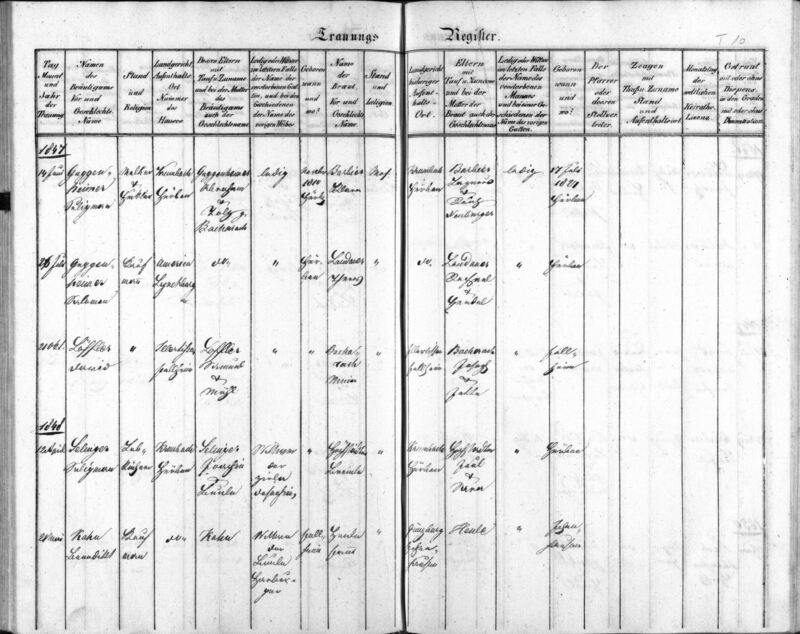 I could find no record of either Mary or Harry after 1935. 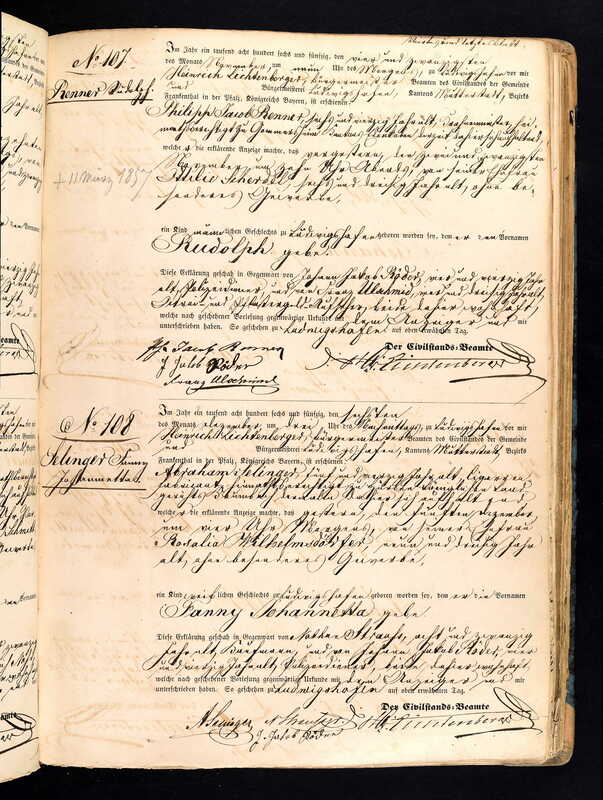 Both of the next two sons, Jerome and Maurice, became doctors. 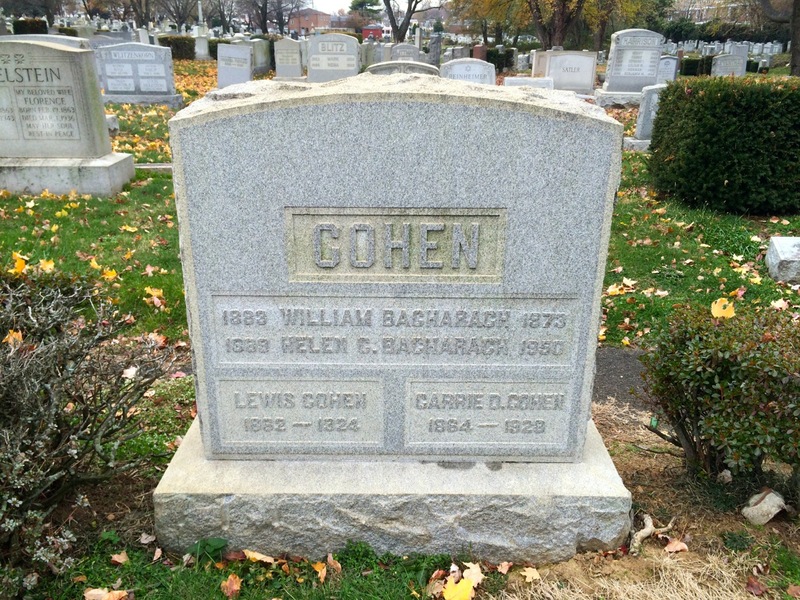 I believe these may have been the first descendants of Hart Levy and Rachel Cohen to become doctors. 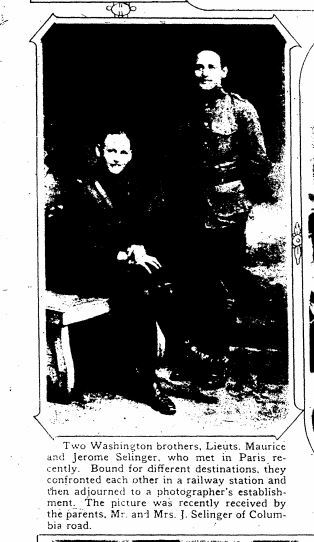 Both also served in World War I, as depicted in this picture of Jerome and Maurice in the Washington Evening Star in 1919. Ethel was a 1910 graduate of Bryn Mawr College. 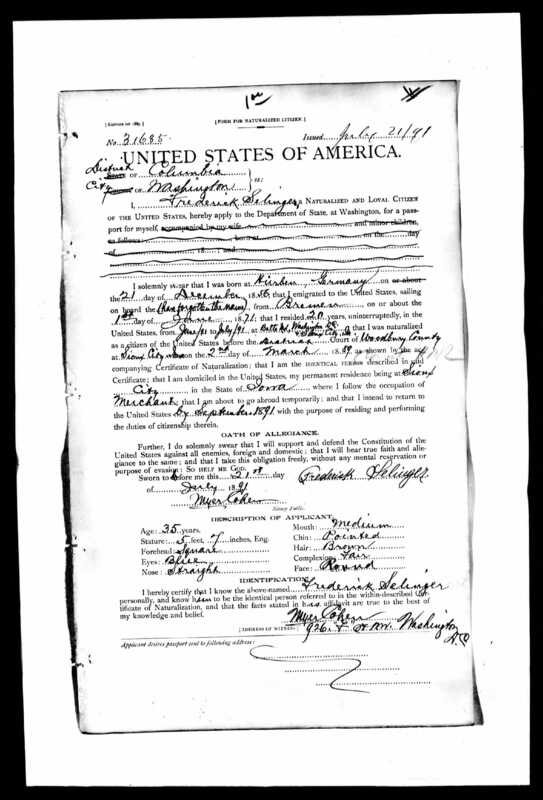 (Register of Alumnae and Former Students By Bryn Mawr College, Bryn Mawr, 1922, p. 28) She had married Benjamin Franklin Keith in Washington, DC, on October 19, 1913, when she was 26, and he was 67. 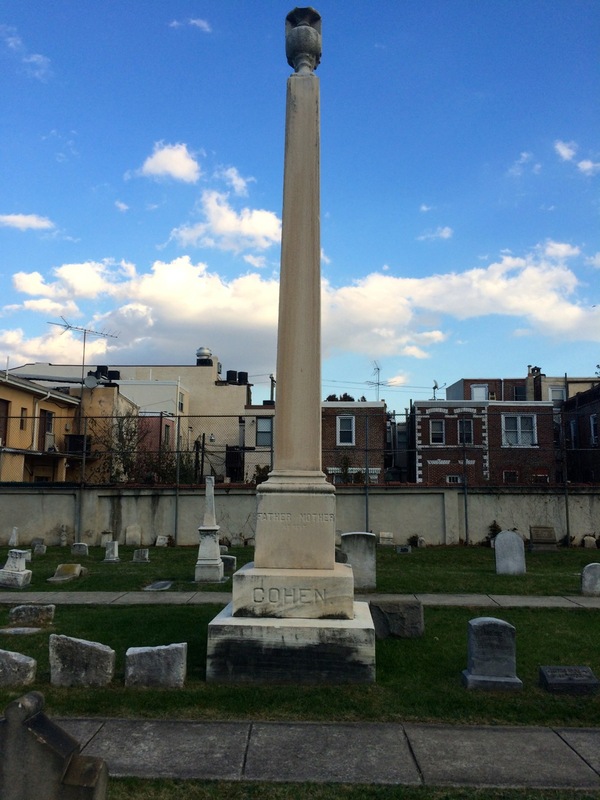 Benjamin F. Keith was a widower, and he died the following year on March 26, 1914, just six months after marrying the much-younger Ethel Bird Chase. Mr. Keith was a well-known entertainer and theater owner in Boston; the B.F. Keith Opera House was named in his memory (now just known as the Boston Opera House). So how did Jerome meet Ethel, I wondered. 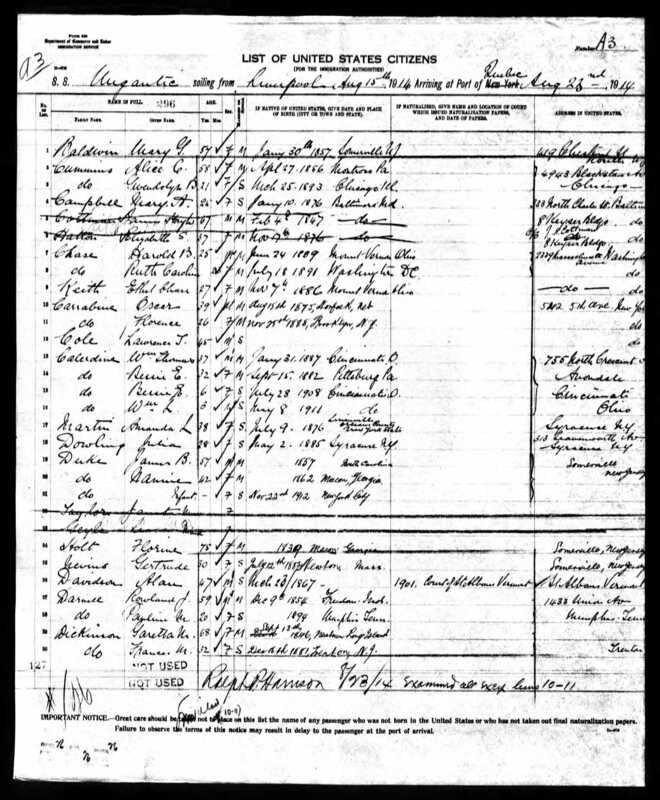 I found a passenger manifest dated August 23, 1914, just over five months after Keith’s death, listing Ethel Chase Keith as a passenger on a ship sailing from Liverpool, England, to Quebec, Canada. At first I thought she was traveling alone, but then I noticed that the entries above hers were for a Harold B. Chase, born in Mt. 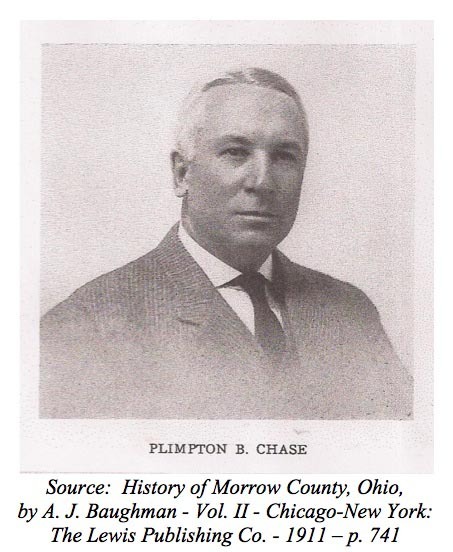 Vernon, Ohio, obviously Ethel’s brother, and Harold’s wife Ruth Caroline Chase. 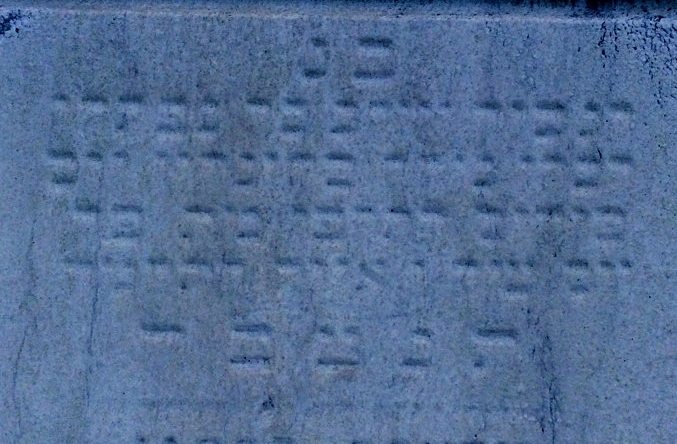 The names seemed familiar, so I checked my family tree, and sure enough, Myer Cohen, Sr., Jerome’s uncle, had a daughter Ruth who married a man named Harold Chase just about a year before in October 29, 1913, the same month that Ethel had married Benjamin F. Keith. So Ethel must have either known Jerome already, as he was Ruth’s first cousin, or she was introduced to him by her brother and sister-in-law. It appears that Ethel was living with Ruth and Harold at that time as well as traveling with them. Unlike the case with her first husband who was more than forty years older than she, this time Ethel married a man three years her junior. Jerome and Ethel had two daughters, born in 1923 and 1928. They lived in Huntington on Long Island, NY, then in Manhattan, and then in Fairfield County in Connecticut. They were active in various charitable activities, and for some time Jerome was the health director for the town of New Canaan, Connecticut. Jerome and Ethel did a great deal of traveling, according to the numerous passenger manifests. According to Wikipedia, Ethel died in 1971. Jerome lived until April, 1984, and was 94 when he died. 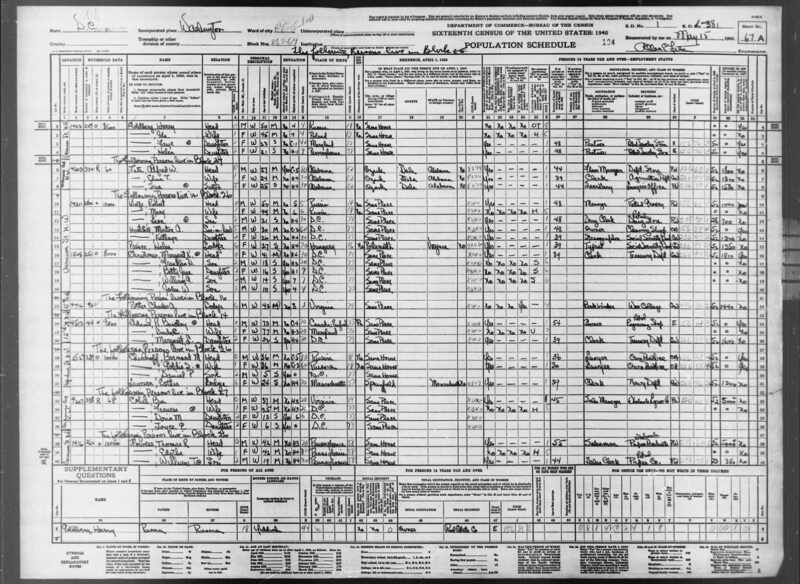 His younger brother and fellow doctor Maurice returned to Washington DC after World War I where he practiced medicine (a general practice, according to the 1930 census). 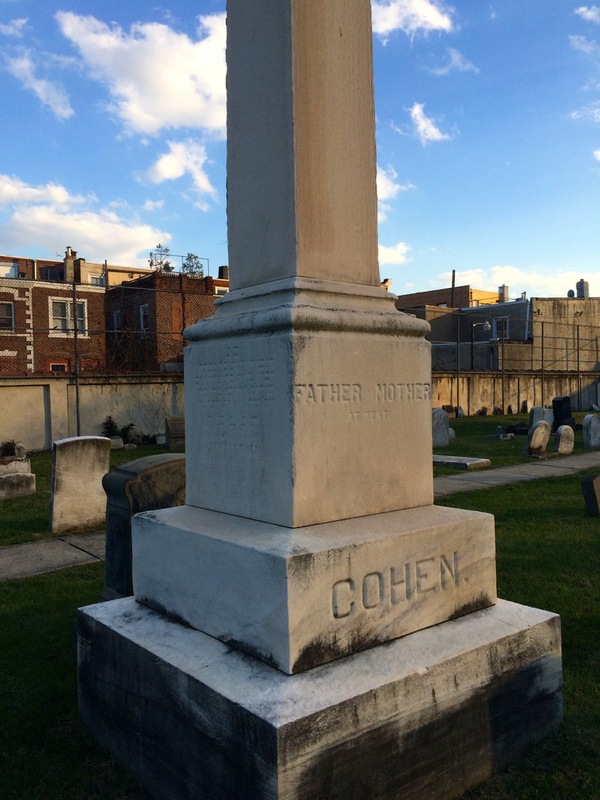 He was living with his parents and sister in 1920 and practicing medicine. 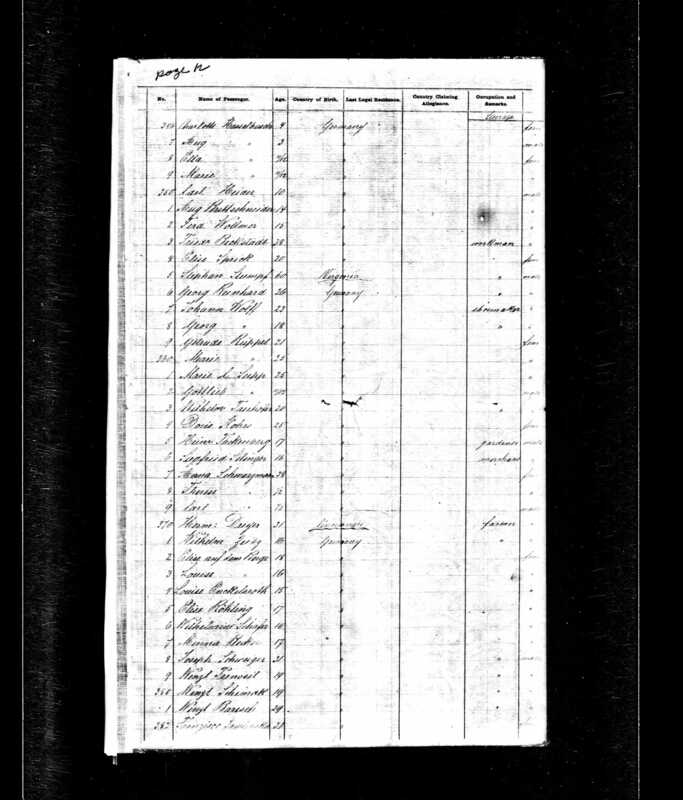 He married a woman named Mildred ( I have not yet located a marriage record for Maurice and Mildred). 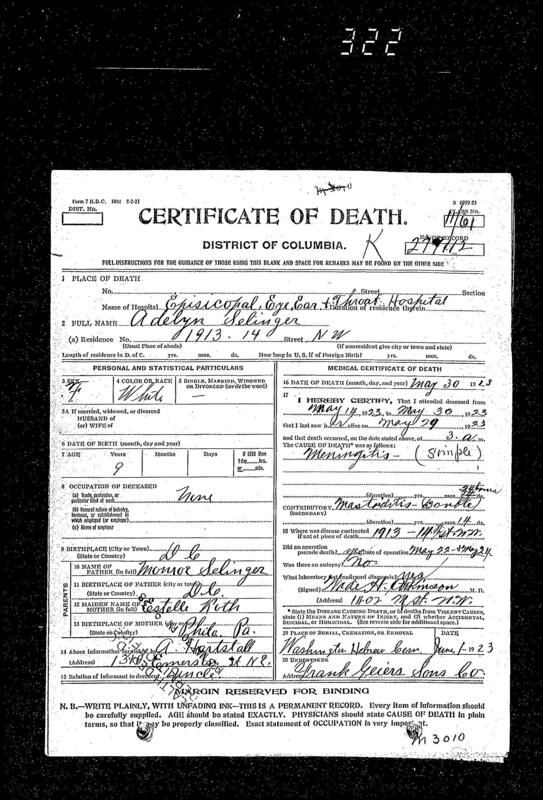 Mildred was born December 23, 1899, in Easton, Pennsylvania, according to one ship manifest. 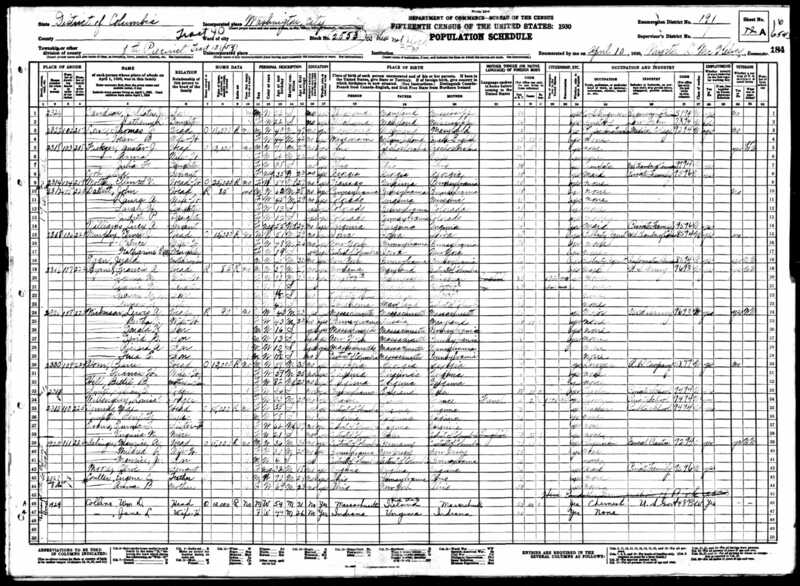 On the 1930 census they reported that they had been married for five years, so I am assuming they were married in 1925 or so. 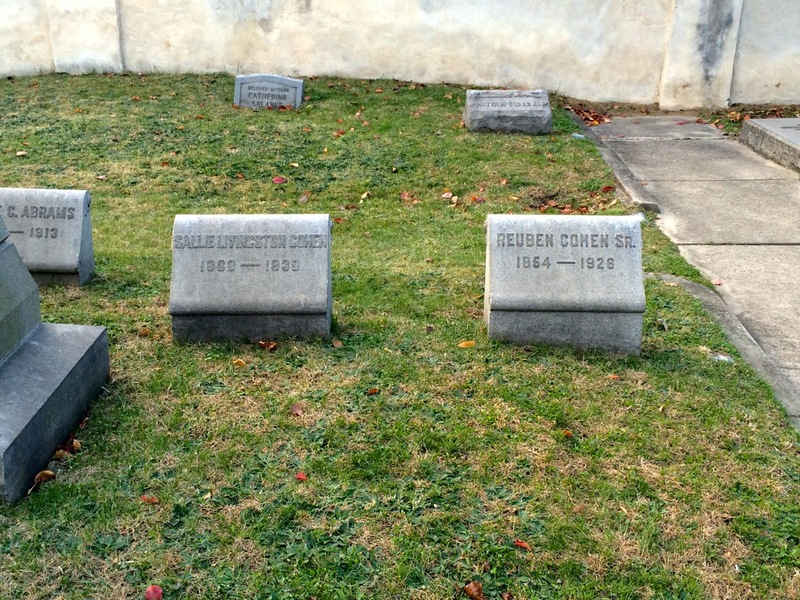 They had two sons, one born in 1926 and the other in 1934. In 1940, Maurice was still in a private medical practice, and in addition to his wife Mildred and their two sons, his father Julius was living with them. Julius was now a widower, as Augusta had died in 1936 at age seventy. Although I cannot find a death record for Julius, he was 87 in 1940, so I imagine that he died sometime in the next decade. Maurice died on August 26, 1965, and was buried at Arlington National Cemetery. 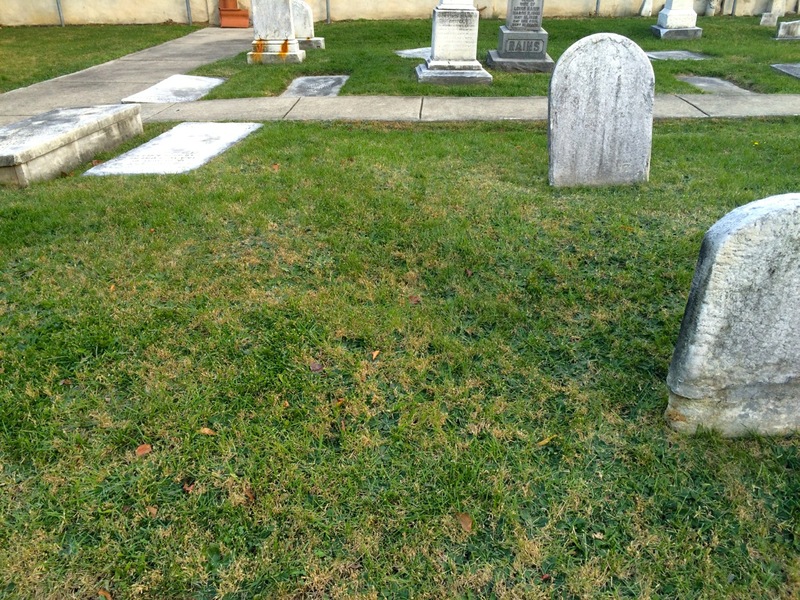 His wife Mildred died March 27, 1981, and is buried beside him. 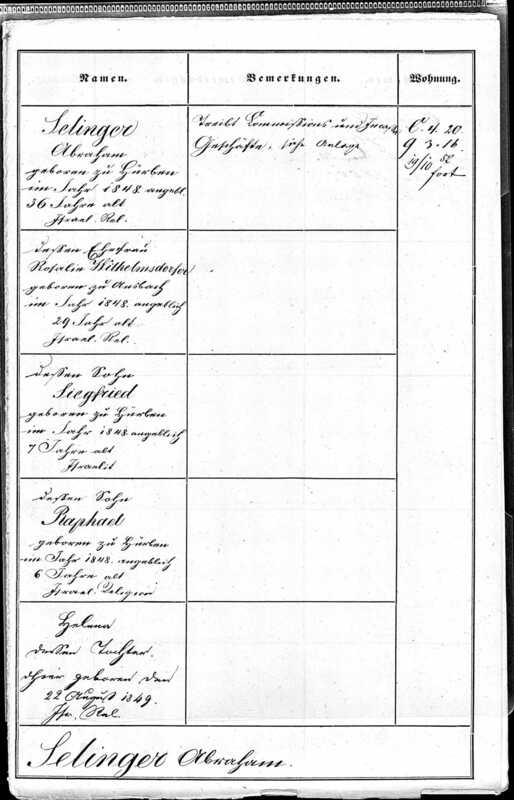 The youngest child and only daughter of Augusta and Julius was Eleanor. Eleanor was still living at home in 1920, working as a bookkeeper at the jewelry store. 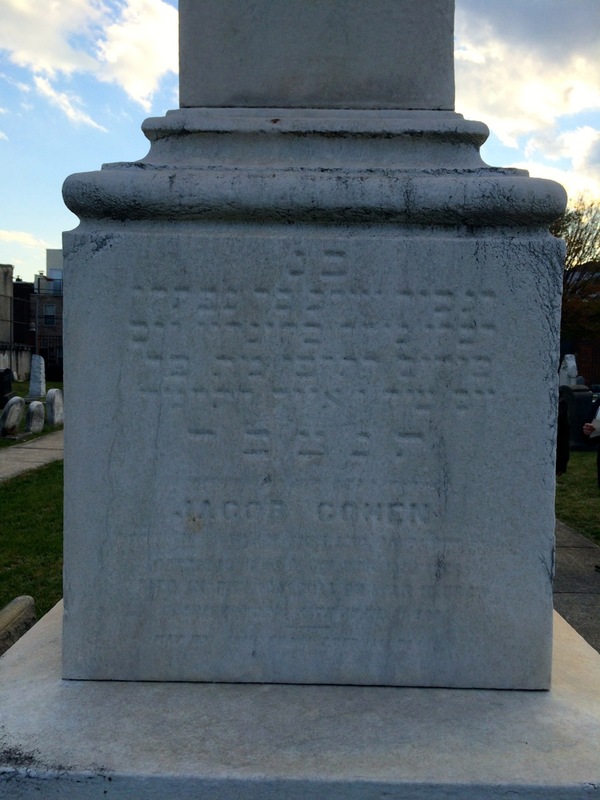 During the decade from 1910 to 1920, her comings and goings were recorded regularly in the Washington Evening Star—whether it was visiting her cousin Aimee Cohen in Baltimore or friends or other relatives, there were numerous society tidbits about her visits. In 1922, she went with her parents to Europe, including England. In 1924 she was still living at home and working as a bookkeeper. In 1925 she traveled alone to England, and then I lost all evidence of her on ancestry.com. 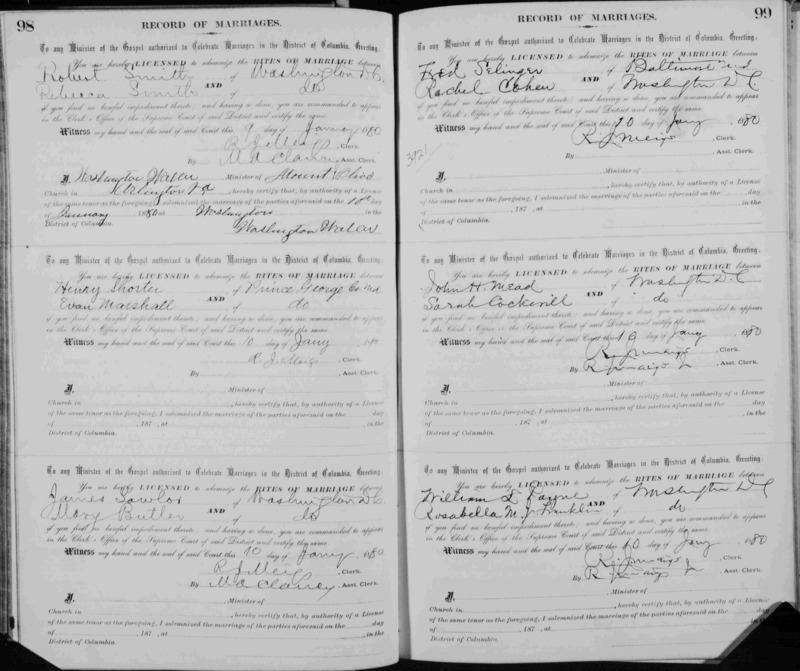 I finally found a marriage record for her in familysearch.org; she married Henry Mortimer Abbot on March 25, 1926. But then I could not find her as Eleanor Abbot. A little more digging, and I finally realized that she and Henry were living in London. 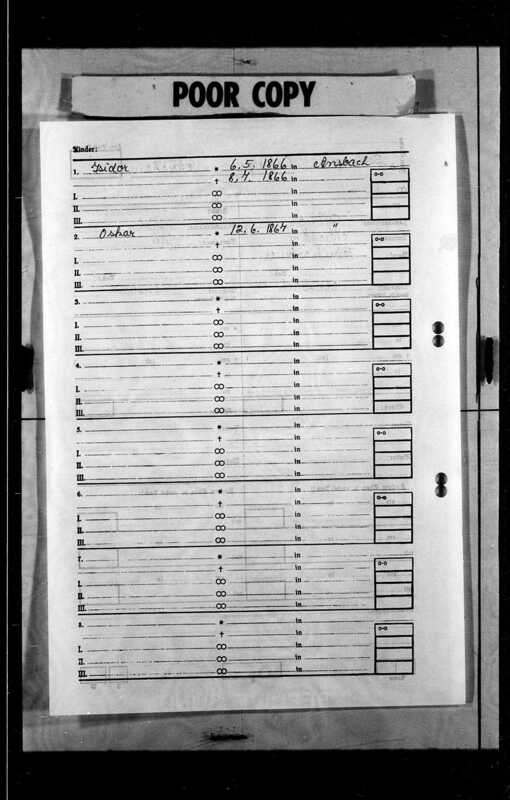 Their marriage record said he was born in England, and the passenger manifest dated April 14, 1926, showed Eleanor and Henry Abbot traveling to England. But then the 1928 directory for Washington, DC, listed Eleanor Abbot as residing in Washington without any listing for Henry. I thought perhaps she had divorced Henry or perhaps he had died, but then there were many trips by Eleanor alone almost every other year through the 1920s and 1930s between England and the US. I was quite perplexed. 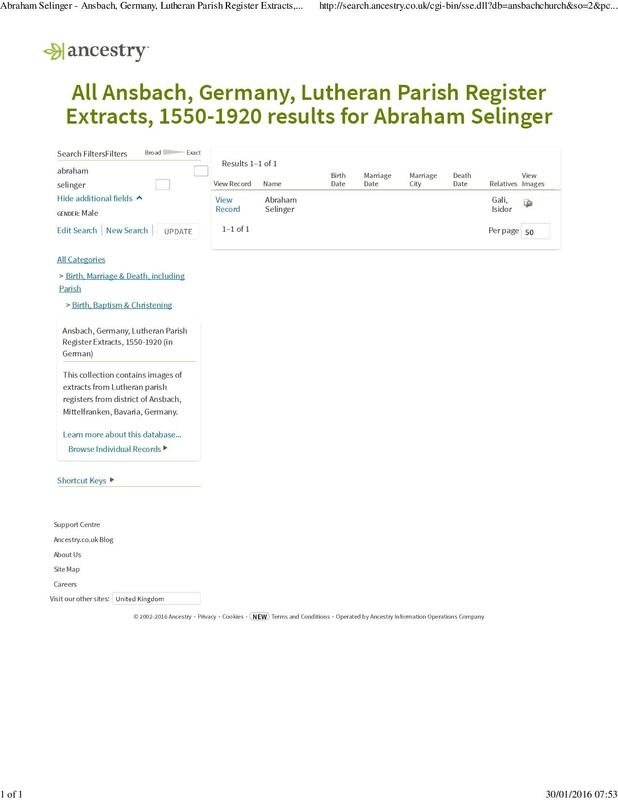 Fortunately, I was able to find another family tree on ancestry.com which listed both Henry Abbot and Eleanor Selinger. 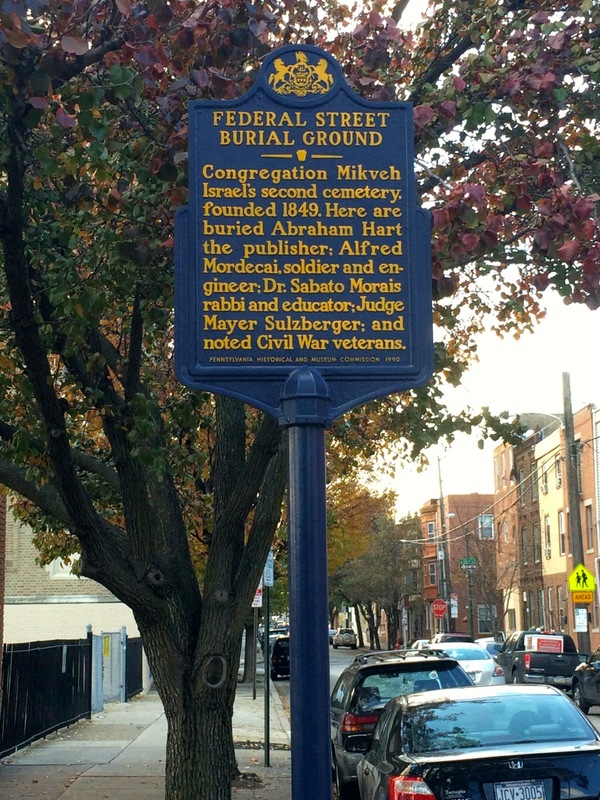 What was particularly interesting to me was that this tree revealed that Henry Abbot was originally Henry Auerbach, son of Hyams Auerbach and Helen Selinger. Another Selinger? 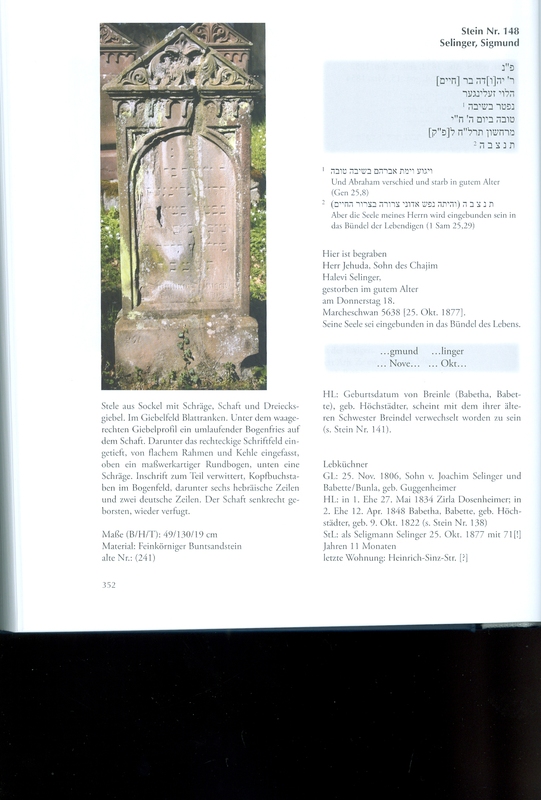 Helen Selinger was born in 1850 in Germany, according to that tree, making her a contemporary of Julius and Frederick Selinger, who were also born in Germany in the 1850s. Could Helen be Julius’ sister or cousin? Had she arranged for her son to meet and marry Eleanor, his cousin? I don’t know the answer to those questions just yet, but I have a lead that may help me find out. 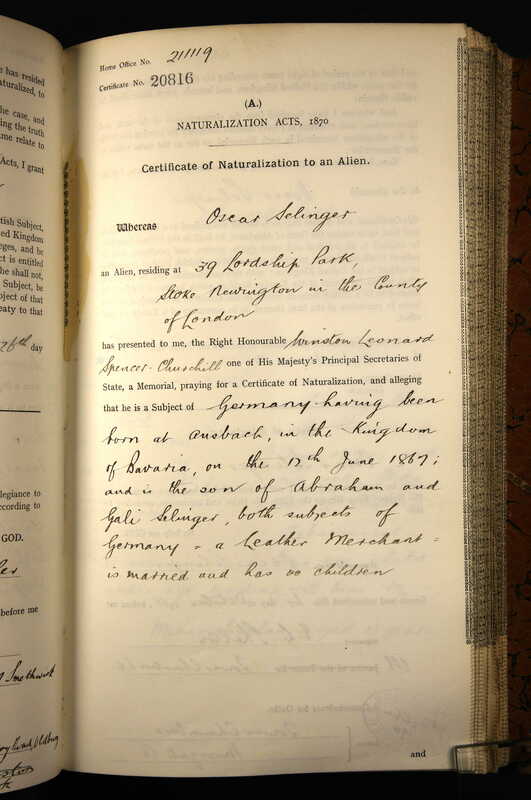 I contacted the owner of the Auerbach tree, and she wrote back to me telling me that Henry Auerbach/Abbot was her great-uncle, her father’s brother, and that she had visited Eleanor and Henry many times at their home in London and that they never had children. 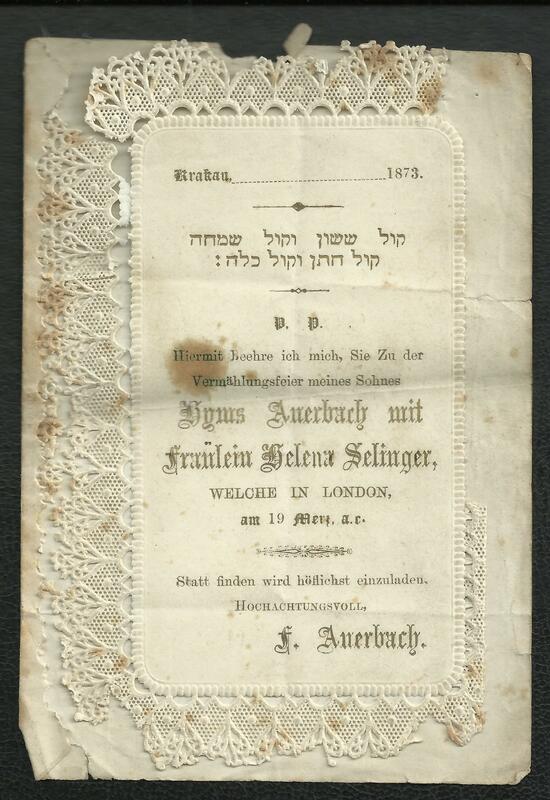 She said that her father’s family, the Auerbach/Abbot family, was in the fur business and made many trips back and forth to the United States for business. I asked her for more information about Henry and Eleanor and am awaiting her response. 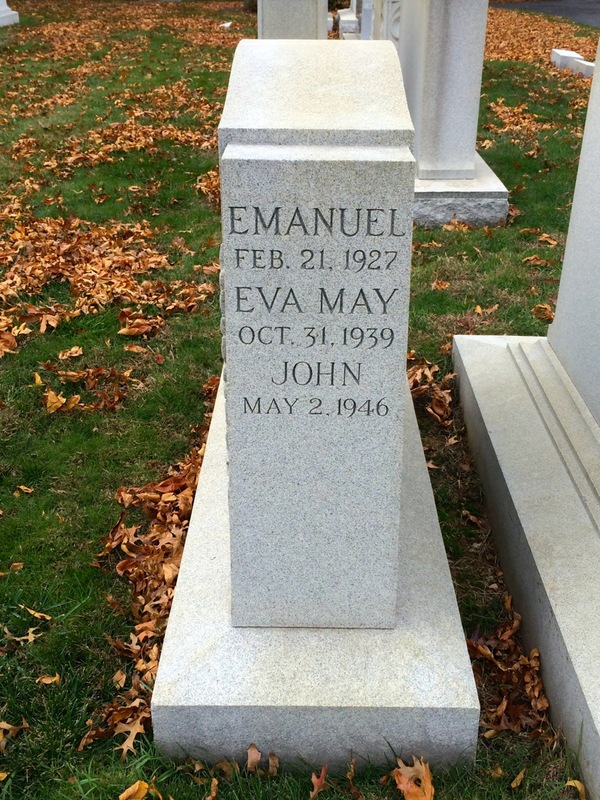 Henry died in 1965, and Eleanor died in 1979. 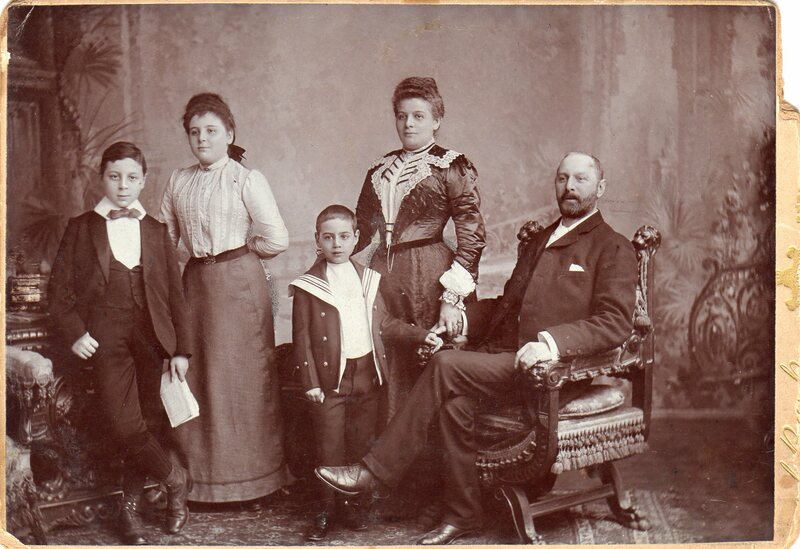 Thus, the five children of Augusta Cohen and Julius Selinger all thrived as adults and seem to have had comfortable lives. Three of their four sons stayed in Washington, DC, although Sydney eventually retired to Florida. Two sons ended up in the family jewelry business, Sydney and Harry. 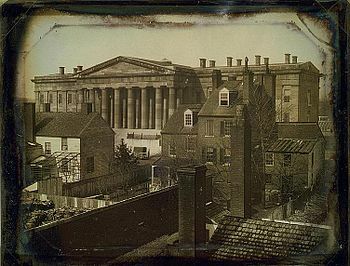 Two sons ended up as doctors, one in Washington and the other in New York and then Connecticut, and their daughter, a bookkeeper, ended up marrying an Englishman and moving to London. Of the five children, only the two sons who were doctors had children, two each, so that Augusta and Julius had four grandchildren. 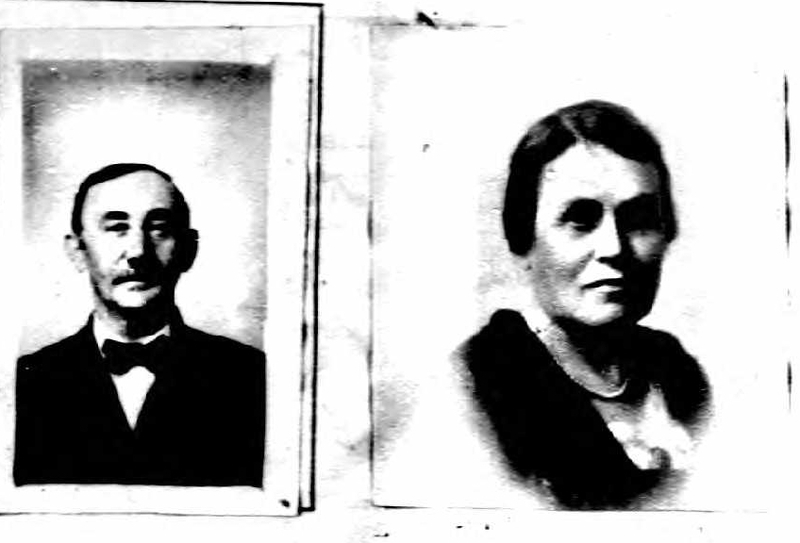 Two of their children, Jerome and Eleanor, seem to have met their spouses through a family connection. Their parents, an immigrant and the daughter of an immigrant, must have been very proud of their children and their accomplishments.